Browsing through Visa offers and the £3 off £8 spend seems to be back (until 18th December). Says available on all registered cards so I imagine if you have access to visa offers (i believe all HSBC current account holders are able to register for this, not sure about any other banks), then you have access to this deal. 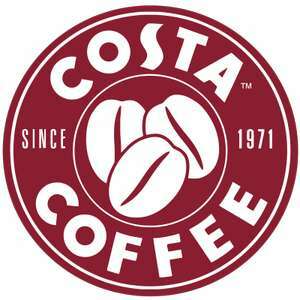 To redeem this offer, you will need to spend a minimum of £8 at Costa. Offer valid in-store for one purchase. now what happens if i have a card registered with hsbc visa offers and quidco cashback? now what happens if i have a card registered with hsbc visa offers and …now what happens if i have a card registered with hsbc visa offers and quidco cashback? Not with Hsbc visa offers. Account specific ? I checked my HSBC visa offers and did't find it ! Also, the link not working if I login into hsbc visa offers. Account specific ? I checked my HSBC visa offers and did't find it ! Also, …Account specific ? I checked my HSBC visa offers and did't find it ! Also, the link not working if I login into hsbc visa offers. Thats what's on my one, by "available on all registered cards" i assumed that meant for all accounts but thinking about it, you might be right by saying it's account specific like last time. Just out of interest, did you use it last time around? [Image] Thats what's on my one, by "available on all registered cards" i …[Image] Thats what's on my one, by "available on all registered cards" i assumed that meant for all accounts but thinking about it, you might be right by saying it's account specific like last time. Just out of interest, did you use it last time around? I just checked offer history and it is showing as expired there. You're right OP! Sorry but....HOW MUCH FOR A COSTA COFFEE?!?!?! 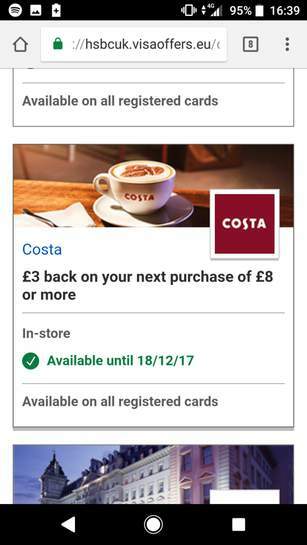 Would this work if I bought a Costa gift card?